Jay Posey is not only one of my favorite authors in the Angry Robots catalog, he’s rising to become one of my favorite authors, period. Sungrazer is the second book in his Outriders series – an action/adventure, military sci-fi space opera. Think Jerry Pournelle crossed with the authors known as James S.A. Corey. There is a bit of a Cold War going on between Earth and Mars. Though there is a coalition between the two governing worlds, things are tense, to say the least, and right now there is an A.I.-driven military assault ship that has gone missing somewhere in deep space. Possession of this ship could change the balance of power and only the elite team known as the Outriders are likely to track this down. As good as the Outriders are, with their cloned bodies which make them nearly immortal, their skills will be challenged here as they come up against smugglers in space and adept agents of the Martian People’s Collective Republic. This book is almost non-stop action, with pauses only long enough to keep the story moving forward with swift discovery, followed by more pulse-pounding action. But what really drives the story, from action moment to story moment to action moment, etc., is the characters. Posey has pulled together a team that is in part a stereotype of every team-oriented action/war movie ever made … but it works. There is a reason you have a bona fide leader, a super-skilled tech nerd, someone who loves to shoot things, and so on – it really does work! And because Posey draws these characters so nicely for us, we find ourselves attached to them, thinking of them as real and we can’t help but want to see them safe and successful. It is this attachment to the characters that also has us turning pages as rapidly as possible. When the group separates we have multiple story-lines going on and we often can’t wait to see what is happening to other members of the squad. While the team is an elite squadron – the best at what they do – there is a small sense of superhero-ness about them. Their ability to sneak in and around undetected, or to escape from any danger, brings to mind a bit of Batman and the Justice League which sometimes pushes the credibility just a little bit. Even so , this is top-notch space opera and well worth reading. Looking for a good book? 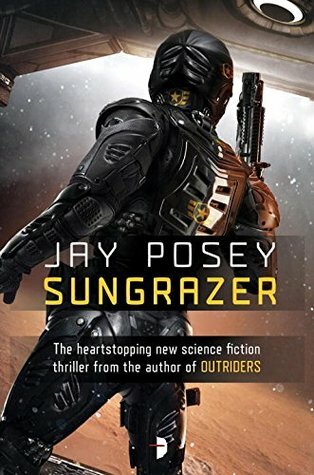 Sungrazer by Jay Posey is the second book in the Outriders series and is thrilling, non-stop action in space and you’ll find yourself holding your breath in anticipation as you read.